A sitemap is an XML document on your website's server that basically lists each page on your website. It tells search engines when new pages have been added and how often to check back for changes on specific pages. For example, you might want a search engine to come back and check your homepage daily for new products, news items, and other new content. The best thing about using BizWebs CMS is that our platform has an integrated capability to auto-generate XML sitemaps. So there is no need to instal any specific plugin or to search generator tools through the internet. Just go and submit your sitemap. So easy. How to submit your sitemap? A. The first place you should take your sitemap for a new website is Search Console (old name Google Webmaster Tools). 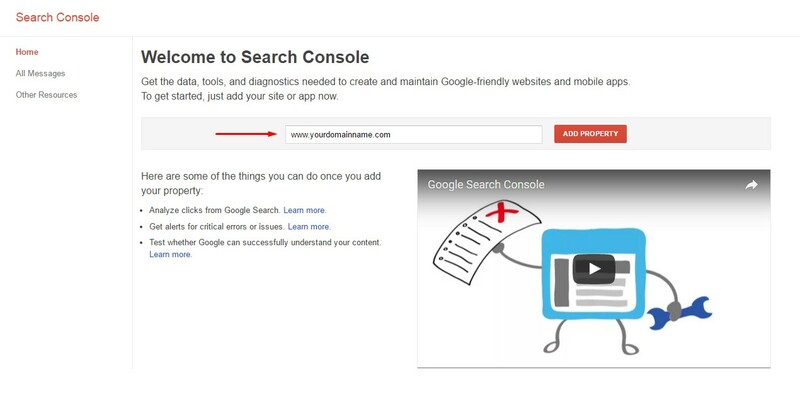 If you don't already have one, simply create a free Google Account, then sign up for Search Console. Add your new site to Search console. B. Tab with Verify your ownership of yourdomainname.com is open. B.1 If you use Google Analytics (connected my website with GA) choose Alternate methods > Google Analytics. You do not have to send us an HTML file code. Just select Alternate methods > Google Analytics and click on VERIFY. A Verifying process is automatic. B.2 If your website uses a special template, tailored one, please select Recommended option. Copy the HTML file code. Send HTML file to info@bizwebs.com. We will upload the file on your website. C. When the verification process is done click on new property (your website). For extra credit, create an account with Bing and submit your sitemap to them via their Webmaster Tools. Tip: Install Google Analytics – You'll want to do this for tracking purposes regardless, but it certainly might give Google the heads up that a new website is on the horizon. Log in to your website and check if you are connected to your Google Analytics account. Go to Settings > Google Analytics > Integrate your website with Google Analytics.